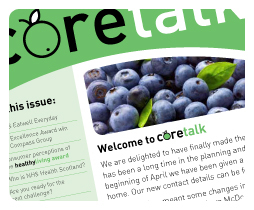 This is where you can find the latest news from the healthyliving award team, including the most up to date edition of coretalk, our quarterly newsletter. If you haven't already subscribed to coretalk you can do so here, using the link on the left, to have the newest edition served up by email fresh to your inbox. 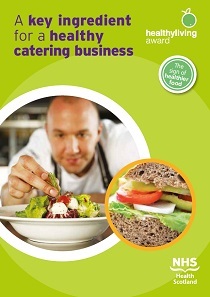 Read about all the latest developments from the healthyliving award and news about what's happening in the catering world, as well as dates for your diary. Your news! Get it while it's hot. Read the Spring 2019 edition of Coretalk, our 49th edition. Calmac Ferries are championing healthy Scottish produce on board their fleet of vessels through the healthyliving award and Taste Our Best. Read the Winter 2018 edition of Coretalk, our 48th edition. VegPower launched a new campaign on 25th January 2019 to encourage children to eat more vegetables. Food Standards Scotland have published their consultation paper on proposals to improve the Out of Home (OoH) food environment in Scotland. The consultation closes on 28 February 2019. Read the Autumn 2018 edition of Coretalk, our 47th edition. Today the Scottish Government have published its consultation paper on restricting the promotion and marketing of targeted foods and drink high in fat, sugar and salt where they are sold to the public. We are holding an award ceremony on the 27th February 2019 to celebrate our most recent award holder’s achievements. If you are working towards achievment of an award and want to be presented - read more about deadlines you need to meet to be included. Read the Summer 2018 edition of Coretalk, our 46th edition. 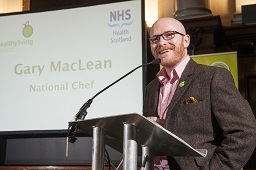 Brand tracking research has recently been completed which enables the Healthyliving award (HLA) to determine awareness of HLA amongst the catering trade in Scotland, assess how this has changed since 2015 and will help inform future marketing plans. In 2014-15 research established baseline measures for various sectors including High Street, contract catering, public sector, community cafes and further/higher education.